As the University photographer, Adam Fenster sees—and subsequently documents—more than the average person at Rochester. And as in years past, he picks some of his favorite photos and gives us a behind-the-scenes look at what makes each one special. 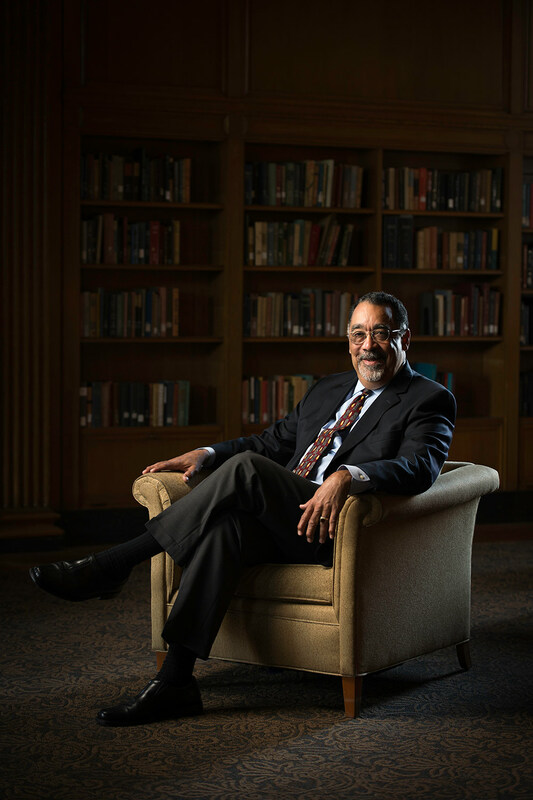 Paul Burgett—musician, scholar, teacher, and University leader for over half a century—died this year at the age of 72. 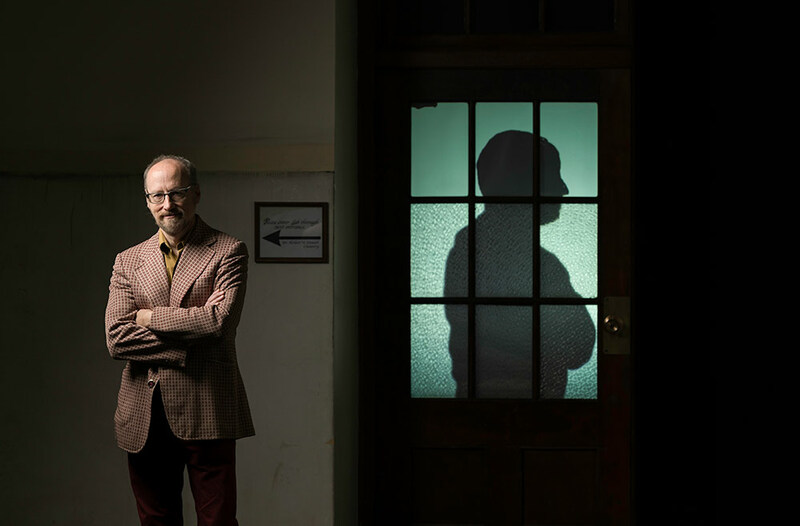 Although this portrait was taken in 2014 for a profile in Rochester Review, Fenster chose to include it among this year’s photos as a tribute to the larger-than-life person many of us knew simply as Dean Burgett. For his portrait, Burgett chose the Welles-Brown Room. Fenster lit him with a soft box while allowing a window just outside the frame to provide subtle illumination on the bookshelves and the right side of Burgett’s face. “The result is a dark, contrasty image that allows Paul’s warmth to shine through.” This portrait was used on the memorial service program and website. 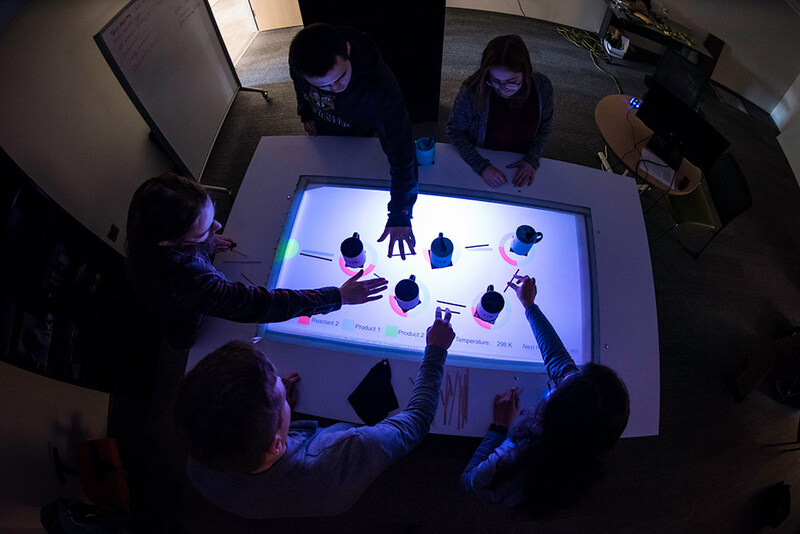 In this photo, chemical engineering students congregate around a table that uses an interactive augmented reality platform to let students simulate the reactions in a chemical plant. Fenster photographed items from the University’s former natural history museum to promote the Ward Project, a new initiative that enables scientists, historians, and archivists to recreate the inventory of Henry Augustus Ward, a faculty member at the University from 1862 to 1875. Louise Slaughter, who died in March, represented the Rochester region in Congress for more than 30 years. During that time, she worked tirelessly to fund and support research initiatives at the University. 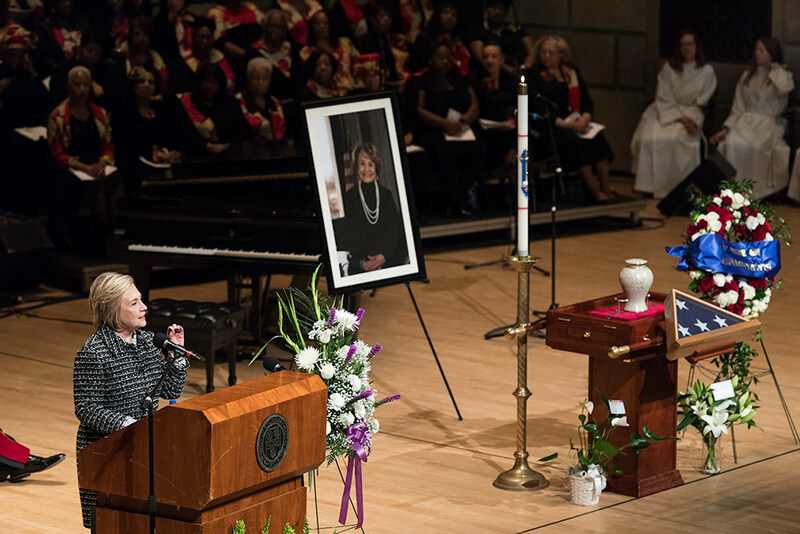 More than 2,000 guests—including family, friends, and government officials—gathered to celebrate her life during a memorial service held in Kodak Hall at Eastman Theatre. Among the speakers was former first lady and secretary of state Hillary Clinton. 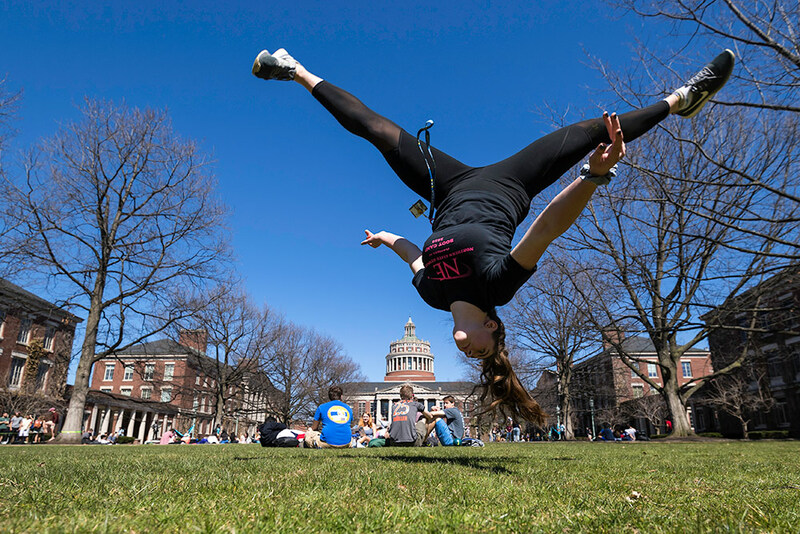 Sarah Cawley ’21, a former gymnast and current club volleyball player, performs an aerial cartwheel on the Eastman Quad in April. “When the weather’s nice and I’m on my way to and fro, I’ll see a lot of activity on the quad, those ‘slice of life’ moments on campus,” Fenster says. When he noticed Cawley, he recognized the potential for a different take on an otherwise typical “kids on the quad with Rush Rhees Library in the background” shot. So, he asked for her permission and then got in low with a wide lens and a high shutter-speed (1/1600th of a second, in this case). “When you freeze the action like that, it almost looks like she’s levitating.” For Fenster, that unexpected element is what elevates (pun intended) this photo to year-in-pictures status. 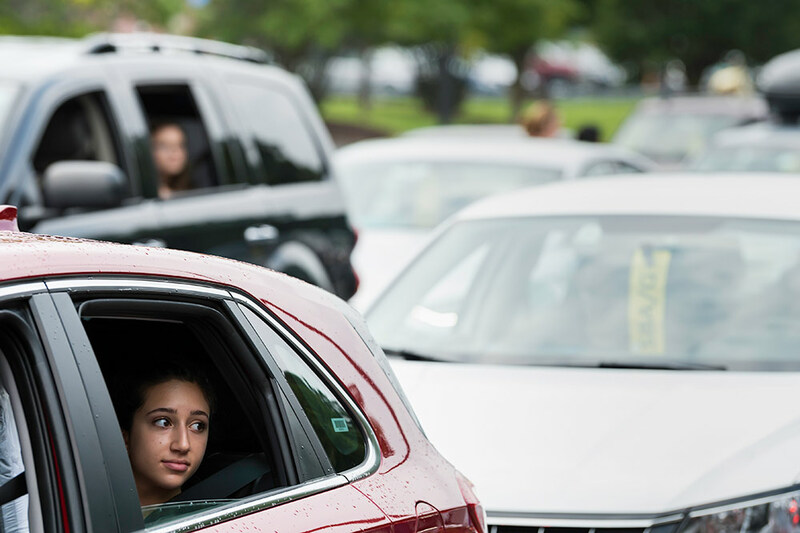 Here, Callista Zaronias ’22 of Broomfield, Colorado, is captured peering out from the backseat of a car waiting in the parking lot. In the background, another incoming student’s blurred face acts as a visual echo of Zaronias and the hundreds of other new students who descend upon the River Campus at the beginning of each academic year. 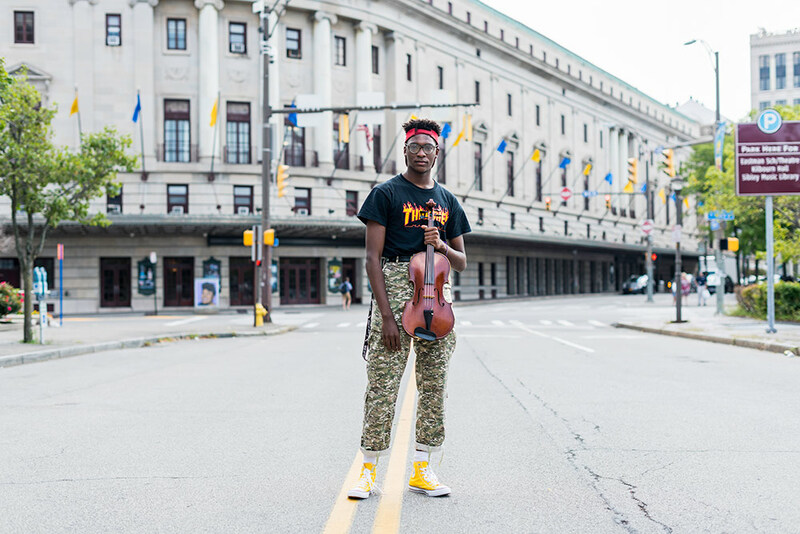 Adrian Jackson, a first-year viola student from Austin, Texas, stands outside the Eastman School of Music for a portrait. The first notable aspect of the photo is the location. “It’s hard to photograph someone in front of Kodak Hall unless you get really far away,” says Fenster. Fortunately, Jackson was game, the traffic was minimal, and the bright but slightly overcast sky created good lighting. The Class of 2022 forms the University’s spirit “R” logo on the Wilson Quad to kick off Wilson Day, the annual day of community engagement for new undergraduate students. For years, Fenster has been advocating to get each incoming class to take a portrait together during the early days of their time at the University. “Credit to Eleanor Oi and the orientation staff because this is the year we finally got it right,” he says. 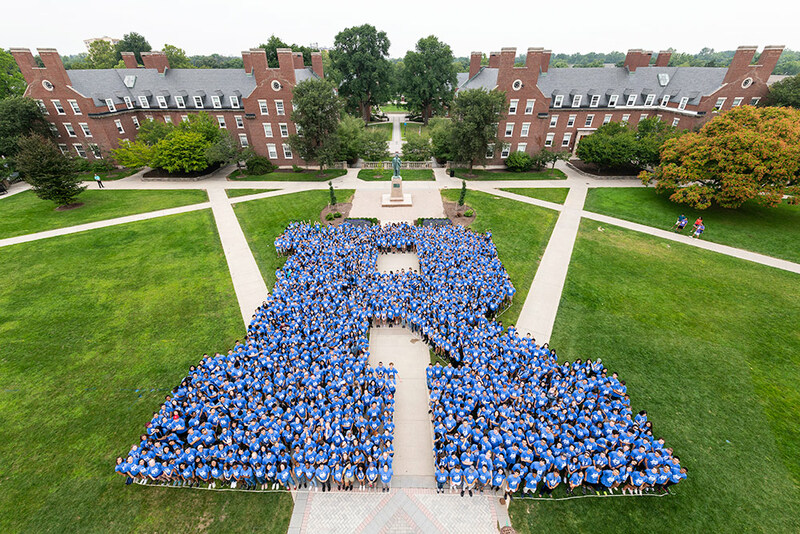 String outlining a giant “R”, hundreds of students in matching shirts, and a bucket truck operated by the facilities team helped make this single still photo possible. 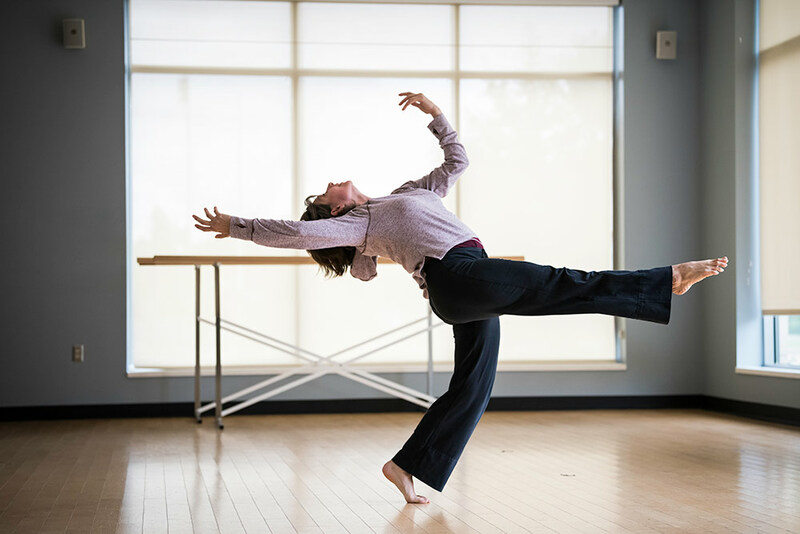 Missy Pfohl Smith, director of the Program of Movement and Dance, was appointed this year to lead the Institute for the Performing Arts for a three-year term. 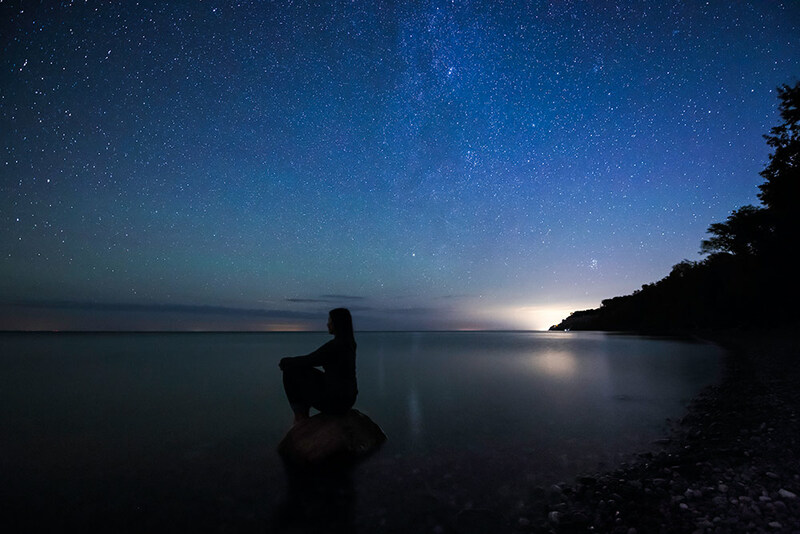 Stars and the Milky Way Galaxy light the evening sky over Lake Ontario, as viewed from the shore at Chimney Bluffs State Park. Fenster was asked to photograph the scene to help illustrate the University’s “Rochester Effect” campaign. Allen Topolski, associate professor of art and art history, is pictured with his installation, “A Common Inculcation,” at PLAY/ GROUND, an immersive art exhibition featuring 29 artists at the former high school in Medina, New York. Fenster brought a single light with him for this outing. The silhouette next to Topolski was continually changing and at one point crossed its arms. “So, I asked Allen to cross his arms, too. He’s a nice guy and was willing to work with me to realize my vision.” And the final result features what looks to be a shadow or cutout of Topolski. 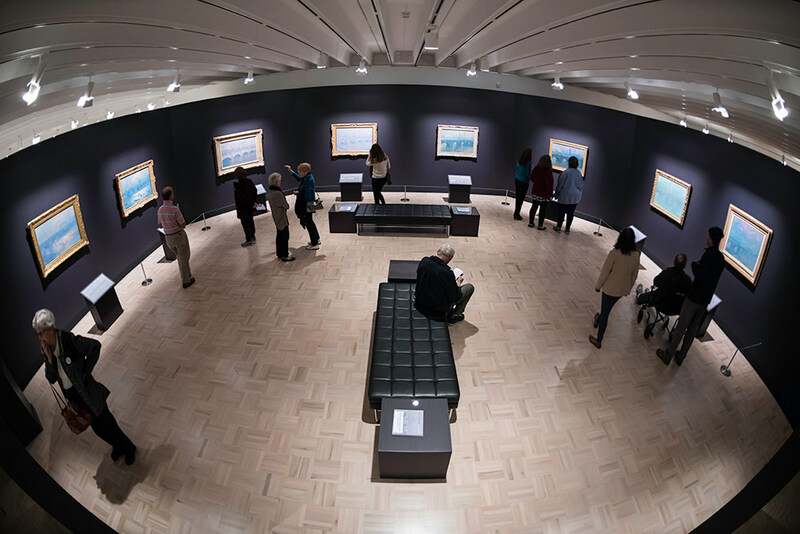 Using a fish-eye lens and monopod, Fenster documented visitors to the Memorial Art Gallery’s exclusive exhibition: Monet’s Waterloo Bridge: Vision and Process. Instead of a close-up of a single Monet painting, Fenster wanted his photograph to tell the story of the whole exhibition: that is, you can take your time to compare, contrast, and contemplate eight versions of the same London scene side by side. Notice how in the photo the paintings themselves radiate with an opalescent quality. “The team at the MAG did a great job with the lighting and layout of the exhibition,” says Fenster. 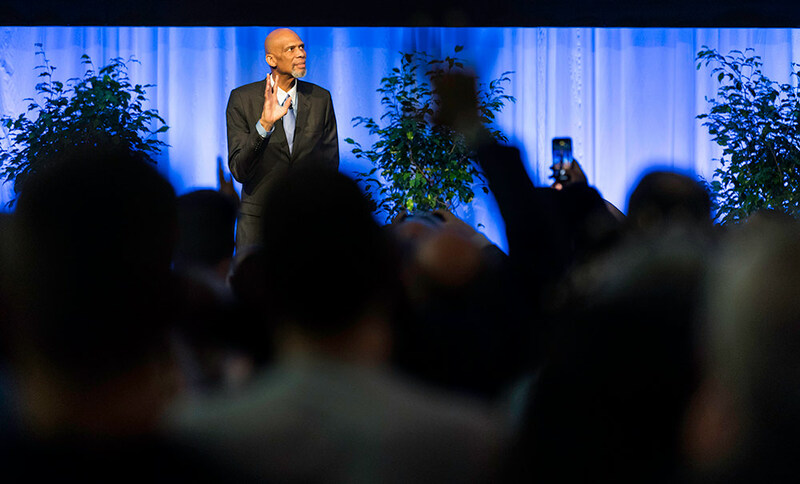 Basketball icon and activist Kareem Abdul-Jabbar visited Rochester in November to meet with students and discuss his perspective on some of the issues dividing the United States, including racism, economic inequality, and social injustice. 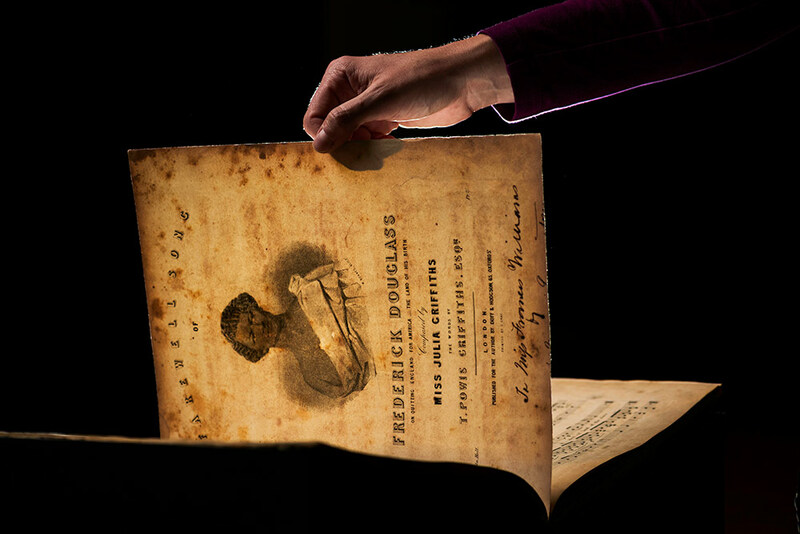 In this photo, librarian and archivist Autumn Haag holds the title page of “Farewell Song of Frederick Douglass.” The piece—one of only two copies known to exist—is contained within a volume of sheet music recently acquired by the University’s Rare Books, Special Collections, and Preservation. Fenster used a front light. But it was the backlight that proved crucial. One tiny flash from behind illuminated the all-important cover page (featuring Frederick Douglass’s name) while also casting light on the sheet music that follows. 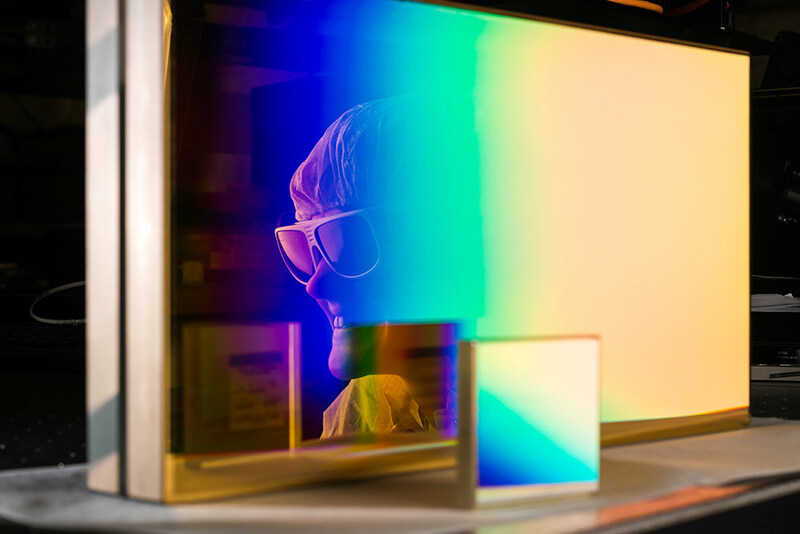 Sara Bucht, a graduate student in the Plasma and Ultrafast Physics Group, is reflected in a grating used in her lab at the Laboratory for Laser Energetics. The smaller grating in the foreground is the one used in the 1980s by Donna Strickland ’89 (PhD) in the work for which she received a Nobel Prize in Physics this year. 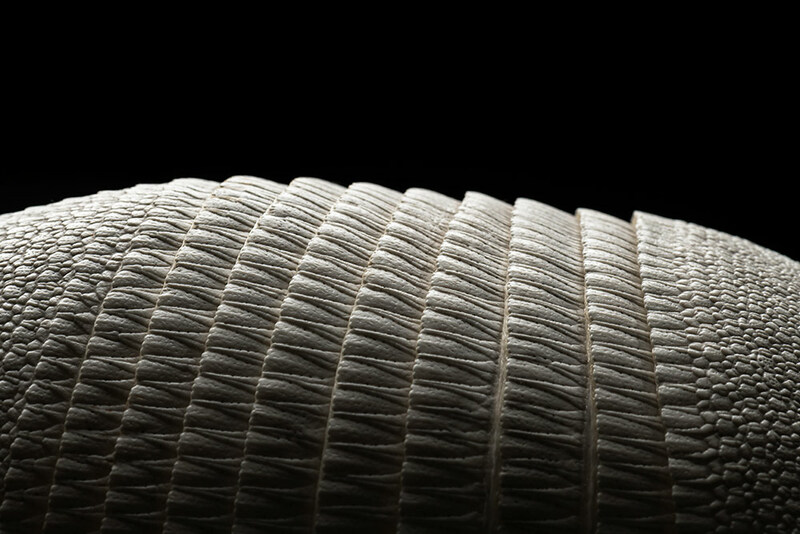 “We wanted to show the contrast between Donna’s original small [grating] and this big new one, and how these researchers are carrying on her work today,” says Fenster. Aptly enough, at least to this writer’s mind, the image successfully blends the classic 1980s aesthetic with a futuristic vibe. The end result is a photograph that is distinctly Rochester.